I just drink mine black. say is give us more! two even all over town. not to be without it oh no! coffee on our break before we go. tell you that’s the most we know. Author/Publisher of five books of Poem Collections. Self-Help/Inspirational writings of wisdom, healing and uplifts that relatively softens life's woes are found within its pages. 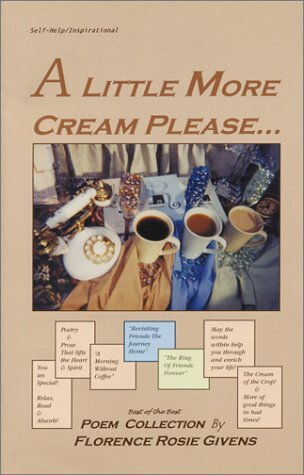 Savoring coffee with all its aroma and jolt is a subject richly shared in the fourth book, "A Little More Cream Please," with poems also about love, difficult times, self-help, destiny, mother & father, children poems and other short tidbits.